Days are getting busier and on occasional, we wished there were more than 24 hours. And by that too, our post getting simpler day by day. Not so much words, but merely photos. But not this post. Hehe. 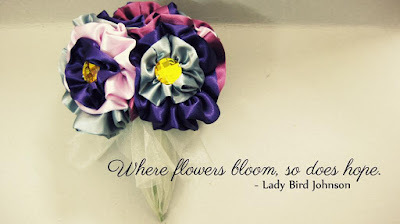 We had the opportunity to make a fabric flower bouquet somewhere last year. It was meant for a bridal shower party. However, only had the chance to share it now. We had so much fun doing the bouquet, except for the part when we needed to wrap it with tulle. Tulle wasn't that friendly that day. Hehe. Oh well, it's obviously we should try to practice more on making hand bouquet soon!